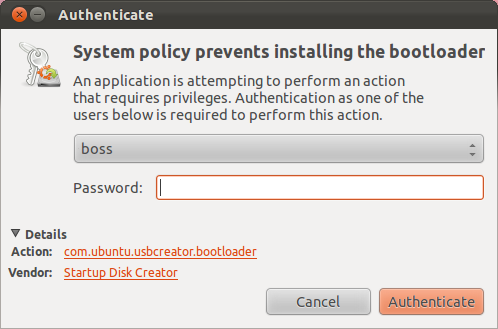 usb-creator-gtk fails to install bootloader: "System policy prevents installing the bootloader"
When creating USB stick from Ubuntu CD ISO image (or any other bootable CD ISO image for that matter) upon finishing copying files onto the USB stick I am getting an error message "System policy prevents installing the bootloader"followed by password prompt. When I enter the password, I get an error message "Failed to install bootloader". The result is the USB stick with all necessary files on it, but it is not bootable. I do have all administrative rights for the account I am using. And if I start usb-creator-gtk from a command line after "sudo -s" it crashes with a segmentation fault just after copying files onto the USB stick. usb-creator 2011-09-25 23:43:00,057 (CRITICAL) install.py:94: Не удалось установить загрузчик. usb-creator 2011-09-25 23:43:00,068 (ERROR) frontend.py:676: Installation failed. DBusException: org.freedesktop.DBus.Error.NoReply: Did not receive a reply. Possible causes include: the remote application did not send a reply, the message bus security policy blocked the reply, the reply timeout expired, or the network connection was broken. Thank you Brian for pointing this out. Using the "usb-creator-gtk --allow-system-internal" command I then was able to complete the job. Still, I was prompted for password 3 times in the process which is a bit too much I believe. And since usb-creator is crucial for netbook owners it is better to fixed soon. It applies to me as well, but after entering my password my USB stick works: it boots nicely with Lubuntu. Question is: is this (still) a bug? It isn't very user friendly though to provide a pop up message referring to system policies. I invoked usb-creator-gtk without knowing that was its name: I used "Startup Disk Creator" from the "Dash Home" thing on my Unity desktop (Oneiric + updates). It would be wise to keep names consistent. The thing failed after 10 minutes of copying files to the thumb drive. This makes retries quite tedious. I don't see any log. Nowhere is there an explanation of how or why to give Startup Disk Creator the --allow-system-internal. Certainly not in the broken help button. Even usb-creator-gtk(8) doesn't explain the flag well. What is a "system internal device"??? This is very unfriendly. I wonder how many users can even find there way here? I will attach a couple of screen shots showing windows left after this failure. It is extremely confusing and stupid that authenticating to policykit (or whatever puts this up) has no effect on the outcome. Failure has already happened. This Oneiric bug looks a lot like https://bugs.launchpad.net/ubuntu/+source/usb-creator/+bug/722019 (Maveric). Hmm. Still fails for me with --allow-system-internal. No logging appeared on stderr (or stdout for that matter). The command did not complete until I had entered the authenticating password. There were two authorizations: one for formatting the USB drive and one for the bootloader. I don't imagine that this is relevant, but the Oneric system I'm using is AMD64 but the system I'm trying to create is i386 (as is the .iso). Interestingly, I seem to have a parentless "/usr/bin/python /usr/share/usb-creator/usb-creator-helper" process running as root. I'll kill it and try again. Hmmm. This time it seems to work. Note: I was again trying with --allow-system-internal. This bug also affects me, and the --allow-system-internal flag did not help. 64-bit Precise, writing a 32-bit Oneiric file out; --allow-system-internal works for me, though the 'Linux is easy' demo had already failed by then. The application is trying to install the bootloader while some buffers (linux buffers, or hardware buffers, I don't know and I don't care) are not finished writing data on the usb key. After 10 failed attempts I finally succeeded by waiting for my usb key led to stop flashing before entering the password required for installing bootloader. so until this bug is fixed I would not recommend to run this app as root. Confirmed in Quantal. None of the solutions suggested above work. Now wait until the LED on the USB has stopped flashing before entering root-password required for writing bootloader to the usb-stick. But the USB-disk created seems to boot and work. If I do not wait for the LED to stop blinking (i.e. disk-writes to complete) before entering root-password it always fails. Still happens in 12.10 ~ Feb 1 2013 with all updates applied. Appears to be related to the amount of data buffered to be written to the USB device. I can confirm that this still happens in 12.10. I can also confirm that waiting before typing the password seems to allow avoid the problem . This continues being a problem in raring. I confirm this really annoying bug in ubuntu 13.04 x64. Ihr System besitzt nicht genug Speicher, um den Absturzbericht zu verarbeiten und einen Bericht an die Entwickler zu senden. Translated: Your system has not enough memory to create a crash report. I have 12GB ram installed. Ubuntu 12.04 64bit, even "sudo usb-creator-gtk --allow-system-internal" is crashing. It's crashing everytime in various permutations. Not really encouraging when you're trying to use to install another Ubuntu. For those looking for an alternative, try UNetbootin. It did the job for me, where usb-creator-gtk kept crashing. Still not working. I use an updated 13.04 Ubuntu, amd64. I tried to creat bootable for 13.10beta amd64. UNetbootin works, but I would like the native software to work, too. Not working for 13.04 32bit! Not working in 13.10 even with the --allow-system-internal option set. I just tried it again and does not work. Then when I boot the thumb drive, it dumps me at a busybox prompt after i tell it to boot from the first drive. Telling it to 'try ubuntu' and it sits and sits and sits and sits and sits and sits. Then you pull the power plug and go eat dinner and wonder what happened. It is affecting me in both raring and saucy. Under raring apparently I did not have a crash of the application when writing the bootloader by creating again from scratch the table partition of the usb key in gparted, formatting it in fat32 and setting the flag to boot. But it seems that it not writing anything I'm still not able to boot from it. I'm suspecting a problem in grub in ubuntu 13.10 iso. I have downloaded it several times. The first time I have tried I have been able to create a bootable usb and then I tried to install saucy on another usb key as standard installation but grub was not showing up at the startup. I have this memory segmentation fault in 13.04, but the USB boots just fine still. But if I remove the USB disk too early, there are files missing causing the installation (from the USB drive) to fail. Affects me in 64-bit Saucy writing the desktop 64-bit distribution onto a USB key (Lacie). Got progressively slower during writing process. Eventually grinds to a halt on 99%, or similar, and crashes. I've been plagued by this bug for years - it's pretty fundemental to installing Ubuntu so would have thought it was worth someone spending time on it. There does seem to be some issue between usb-creator and dbus. This bug affects me on Ubuntu Studio 12.10, 32-bit. It seems waiting until light on USB drive stops blinking before typing password (as suggested in this thread) might be a workaround. I managed to successfully create an image once, and it could be that it was some waiting before typing the password. Run from cli "usb-creator-gtk --allow-system-internal" it asks for system password, seems to run as root and crashes with the message "Segmentation fault (core dumped)" while creating the persistence file. Run from cli "sudo usb-creator-gtk --allow-system-internal" it crashed without any error message while still copying files (before the creation of a persistence file. Run from cli "sudo usb-creator-gtk" it crashed without any error message while finishing. Will try if it created a bootable stick and report back. See my previous comment. Even if crashing, it seems "sudo usb-creator-gtk" made a working USB boot stick. Same issue here - I've always reported the issue when the crash happened, so the team might have a few crash bug reports on it. Also, since this bug makes the software completely useless - it doesn't do the one thing it's supposed to do - I suggest making the importance of this bug "critical". Always ask for password before installing bootloader. And when i entered it too late, it just failed, render the long awaited process useless. This is serious anoying bug. One password at start should be enough, no need to ask it repeately. This issue is also present on 13.04! I agree with @mmalmeida, importance should be critical. This provided a working boot media for me after several repeat runs hitting the bug in this thread. I am using bash shell (Ubuntu's default), so change the unset call if you are running a different shell. I found the variable to unset by running `env | grep -i dbus`. OS: Ubuntu 12.04 x86_64 with all system updates applied. I'm running a dbus/fluxbox X session and not ubuntu-desktop. Note that usb-creator will provide a definitive confirmation window when it succeeds. If you don't see a clear message telling you that it's done, assume it crashed and the media may not boot. "Wait until the LED stops flashing", some have recommended. But there are plenty of USB sticks, even ones from well advertised brands such as SanDisk, that don't have an LED. Presumably users of such sticks are expected to be psychic? It does fail in my case, LED or no LED. The workaround described in #46 by Ron Duplain still works for me though. Can confirm I'm getting this on 14.04, fully updated, trying to make a USB 15.04 installer. and from that point on the erasing takes forever. Not only that but when I finally close the USB Stick creator window, I am left with the USB stick labelled with the chosen distribution name, and appropriate files appear to be copied over. This is very confusing, given the instructions on official Ubuntu site claim the process of making the bootable stick is straightforward and is easy. same on 15.10. workaround above does not work any more. While it does not work for me in Ubuntu 14.04 LTS, Ubuntu 15.10 was able to get past the error.